TPD – Robert M Baxter Jr. / Parent: Robert Baxter Sr.
Robert M. Baxter Jr. is the son of Sergeant Robert Baxter and retired Detective Josie Baxter of the Tampa Police Department. He has a twin sister, Rosalyn, and older siblings Jessica and Rey. 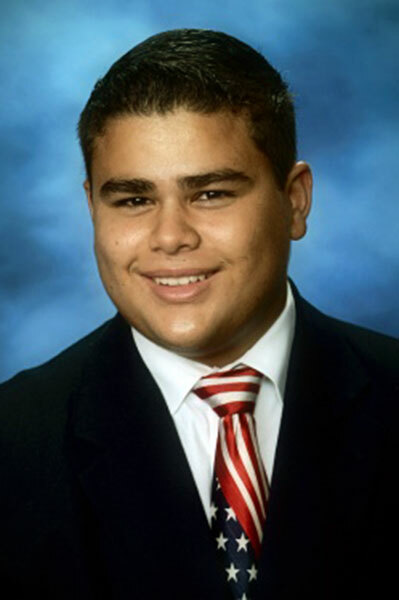 Robert will graduate in June from Vivian Gaither High School with a weighted GPA of 4.83. He is finishing his fourth year in TV productions class, and he is in his final year of veterinary assistant classes. Robert participates in activities at his school and in the community. He is a member of the National Honor Society and the National Beta Club. Robert is a dedicated member of the varsity track and field team and has lettered with the Gaither High School Shot Put and Discus team. He is an active member in Future Farmers of America (FFA). In his time as an FFA member he has participated in the raising of swine and dairy heifers for State Fair competition. Robert plays the bass guitar on the youth praise band at his church. Through his church and scouting, Robert has done countless community service hours and has assisted with charitable and mission projects. On February 2nd Robert Baxter sat before the Eagle Scout board of review to see if he would be awarded the highest rank in scouting, Eagle Scout. He has been in scouting for seven years and is very committed. He successfully passed his board of review and had completed all of the requirements and was awarded his Eagle Scout rank. Robert is an avid salt water fisherman and has a passion for animal care. Robert Baxter plans to attend the University of South Florida to get an undergraduate degree in veterinary medicine, and to continue onto the University of Florida to receive his Doctorate of Veterinary Medicine. Robert aspires to become a veterinarian working on large animals and livestock.